It would take a better musicologist than I to track the precise steps that bring this song to us in its most popular rendering, that of the Grateful Dead. That said, even a modest effort in the age of the internet (and its vast reserves of early recordings) gives us a leg up on Jerry Garcia, Bob Weir and the other members of Mother McCrees Uptown Jug Champions in the early 1960's. Had they had access to the same resources, chances are the song never would have existed in this quizzical form: Don't Ease Me In. After all, what could that possibly mean? That's enough to give big-eared cryptographers a workout, but it sure sounds like, "Don't ease me in" doesn't it? It wouldn't be the first blues tune with lyrics that ring nonsensical to folks of another era and a different culture. Plus, it rolls off the tongue nicely. Who knows, maybe that's actually what Thomas was saying on this take. In any case, whoever among Jerry's crew first learned the song just ran with what he had and didn't ask too many questions. Questions like, "I wonder if Henry Thomas did any other recordings of the song?" If they'd asked that one, they might have run across this next track, recorded under the more transparent titleDon't Leave Me Here. Mystery solved, which is good news or bad news, depending on how you feel about unsolved mysteries and nonsensical lyrics. One more syllable away from the original title and we find Don't You Leave Me Here credited to none other than Jelly Roll Morton. That song was in circulation around the time of Thomas' recording and while the melody and words are not exactly the same, there are too many crossover points to be explained away by coincidence. 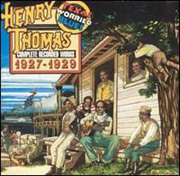 My uninformed, but not unfounded guess: Henry Thomas was somewhat familiar with this song and came up with his own based roughly on what he recalled of it. Go ahead and have a listen for yourself. 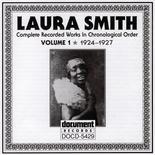 This is Laura Smith recorded in 1927 singing Morton's Don't You Leave Me Here. So how come, you might well ask, are we learning the song as "Don't Ease Me In" rather than "Don't Leave Me Here?" Simply because a lot more people have heard of the Grateful Dead than of Henry Thomas, Laura Smith or even (sadly) Jelly Roll Morton. As mentioned above, Garcia and Weir were playing it in their pre-Dead jugband days. It was one side of the Dead's first single released in 1966 and never fully retired from their concert repertoire. Whatever the song's roots, it is now its own cryptic self. In an odd tip of the cap to street-musician Henry Thomas, I was reminded of the song's existence by one of Northampton's many buskers. And they get the last word on what is legit when it comes to blues. Don't Ease Me In went through many small changes over the years of Dead performances. This clip is from a 1989 live performance in Pittsburg, PA. Jer-ry!